This eyeshadow spoilt me with its quality and its blend ability. It is superb. It is my everyday eye palette and i surely will repurchase. I didn't expect my package to arrive right away since I made the order either friday or saturday. Also, I get timely updates on both sms & email which is superb! Package arrived in good condition, nicely packed! Zero kickback & fallout, stays in place for 10 hours. Blends like a dream. 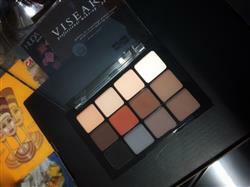 Definitely recommending Viseart palettes! This is a basic palette that I really enjoyed. The pigments are finely milled so it layers and blends really easily. If you are going to own just one, this is a must-have.